were vintners – I learned that grapes don’t need tons of water to grow and the wine they make tastes great. The ground around our house was literally splitting. Small chasms appeared in the ground. I was beginning to feel like we were living in the dessert not the verdant hills of Campania. We headed to Sardegna for a two week crash immersion class in Italian at Centro Mediterraneo Pintadera and left the drought behind us. Taking classes and organizing activities for Nonna’s Mulberry Tree’s first group activity didn’t leave me a lot of time to play on Facebook or even read one of the newspapers from Benevento. It wasn’t until we were packing up to leave that I discovered it had finally rained in the province of Benevento. And when it rained, it rained and rained for over 24 hours. It started Wednesday, 14th of October and didn’t end until almost Friday morning. This was not your happy “I’m singing in the rain” rain but a deluge that wiped out railroad lines, sent mud slides and rock avalanches down the hills into the center of towns, and caused floods that led to deaths. In our over televised and I think desensitized media watching world, it is one thing to see the video of cars floating in streets and another to actually see, smell and feel the devastation. Having heard from our best friend, Nicola, how bad it was for others and how we were spared. I wasn’t afraid to head for home. Potelandolfo was only without electricity for two days. Other towns are still without. Today, 20 Ottobre, our water is brown. They are flushing the pipes. Other towns do not have any water. Our house and the village center are positioned on the hill in such a way that we didn’t get hit with any mudslides or rocks. The periphery of Pontelandolfo wasn’t so lucky. Roads in the outlying contrada washed out and mud found its way where no one wanted it. Neighboring Casalduni was underwater and mud. The roads are still impassable. Casalduni citizens are without electricity, water and the ability to leave. The dedicated mayor, Pasquale Iacovella, has been going in and out via tractor to get things organized and solicit help from the government. Ponte, further down the mountain, has piles of rocks in its streets. Benevento, our provincial capital, was underwater and people died. The state was rebuilding a bridge on the highway between Campobasso and Benevento. I don’t think they will finish anytime soon. The bridge and highway were destroyed. Solopaca is home to some of the areas best and largest wine cooperative cantinas. Before we left we saw the parade of farmers bringing grapes to be processed into Falanghina Del Sannio DOP and Algianico DOP. Now the cantinas are ruined. The equipment was under mud and water and the grapes that weren’t harvested are a soggy history. The loss of income for so many people is incredible. Rummo, a pasta manufacture in Benevento was obliterated – that means until they rebuild the jobs are gone too. # Save Rummo is the social media campaign started by the company and its employees. Our personal confrontation was nothing compared to the devastation around us. We figured getting home might be a challenge. Trenitalia sent us an e-mail saying our train from Roma to Benevento could only go as far as Caserta. Gulp. We weren’t sure how we would get back to Pontelandolfo but we were going to try. After the 45 minute flight from Alghero to Roma, we began our day long journey home. I went to the information kiosk at the train station ad asked if we should try to go to Boiano – not a good idea. OK, how do we get out of Caserta? “We will have buses to Benevento.” We took a train to Caserta and were herded with those going beyond Benevento to Lecce onto a convoy of 8 giant buses. There was not a place for carry on bags and the undercarriage luggage spot was jammed packed. The bus ride seemed endless. All interior roads were avoided. It seemed like we were going from highway to highway in an endless circle. Eventually, we made it to the Benevento train station where Nicola was waiting for us. On the slow ride home we travelled roads narrowed to one lane by mud piles on either side. 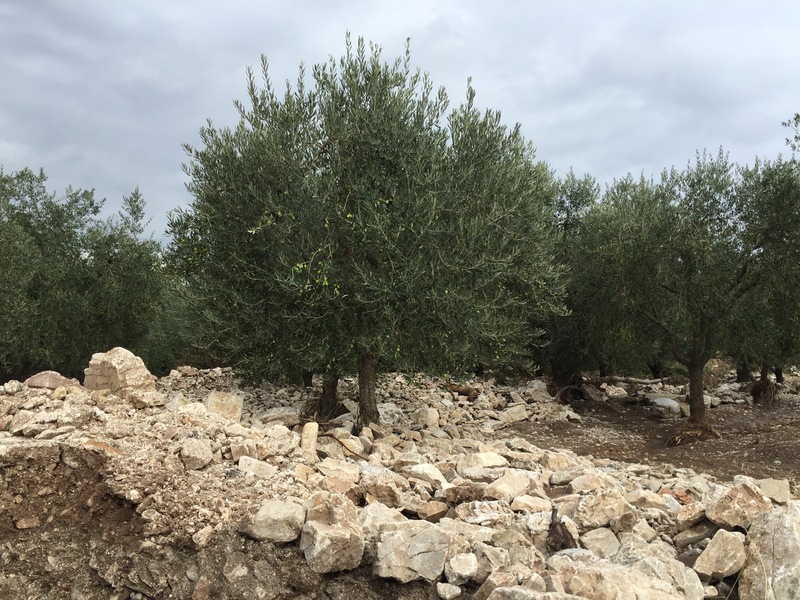 Olive groves were now rock gardens. Piles of furniture swayed near the street outside of homes. Water was still slowly receding anywhere there was a depression in the ground. Having lived at the Jersey shore and been horrified by the flooding in places close to the sea. We understood how devastating floods could be. What I didn’t understand was how it could flood in the mountains. Now I have seen it. The elders tell me that they have never seen weather like this or a flood like this. Yup, the weather belts are changing. Global Warming can do that you know. It started raining again on Monday. That means we have only been with out rain for 2 days since the flooding. I hope it stops soon. No one is singing. Echoes of South Carolina, where 2 weeks ago, after a summer-long drought, our state was devastated. Fortunately for us, all the really bad flooding was south of where I live. My road was washed out for a short time, but we never lost electric. Then the other day drought-stricken southern CA was hit and suffered severe mudslides just like you saw in Italy. They had heavy snow in upstate NY yesterday. The weather is, indeed, changing. Glad your home was spared. I always wonder if NJ will soon have the temperature of Florida and Florida get snow. What is happening to the weather? “They” are saying this winter is going to be cold and wet. We have had 10 degree colder temps for the past few days (30s nights and 60s days), but it’s going up to 80 by Thursday! Omg…horrible. I’m so sorry but glad that u & jack made it home safely; also that your home is ok.
Over the weekend in Connecticut and New York it was 26 in the evening and today it is 70???? Hope all your relatives are at least safe. Flooding in mountains? Very Very scary, glad you got home safe. Never a dull moment.